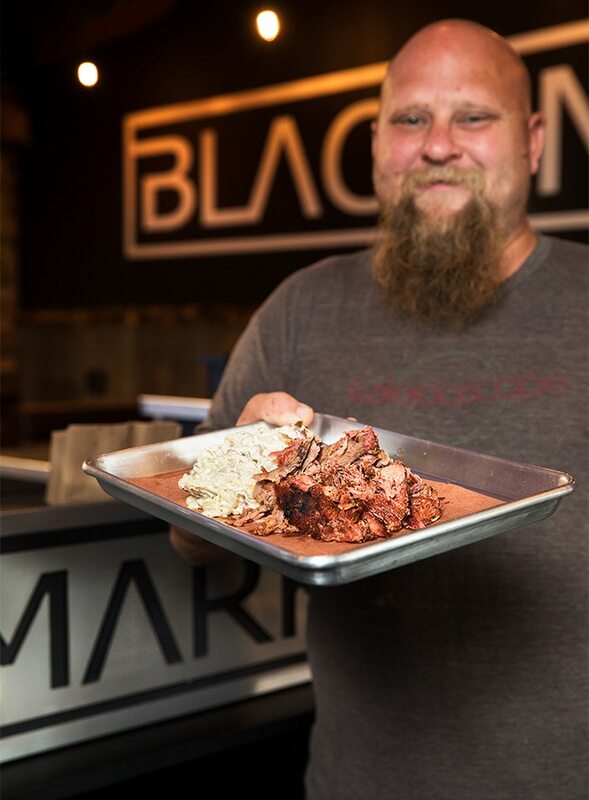 Wes Johnson is a new player in the local barbecue game with his recipes at the new downtown venture, Black Market Smokehouse. My favorite kind of sweat is meat sweats. 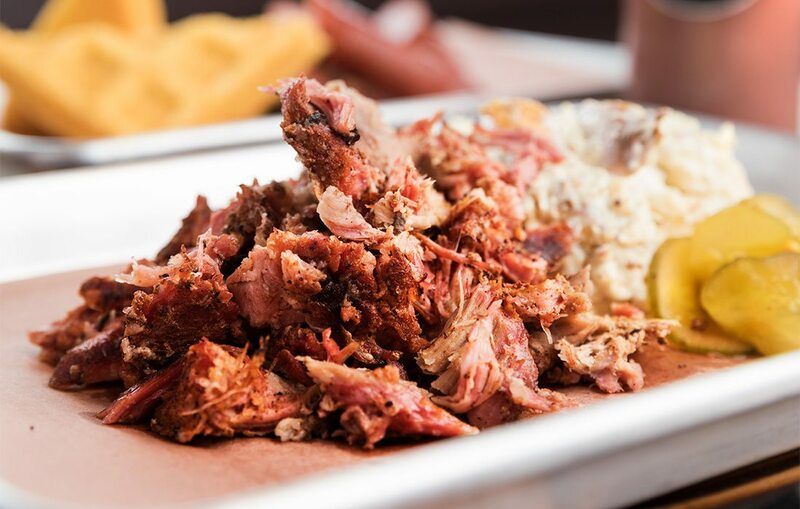 Although it’s an admittedly gross phrase, it envelops everything that’s great about barbecue: eating smoky meat, competing for elbow room with your friends and getting a little too full for comfort. Hey, it’s better than cardio, right? I got my latest workout on a recent Saturday evening when my boyfriend, Brandon Pratt, and I did a double date with our friends Katelyn and Kevin Robertson. We walked in a with a game plan: We’ll get ¼ pound of each meat and the sides we wanted, all a la carte. 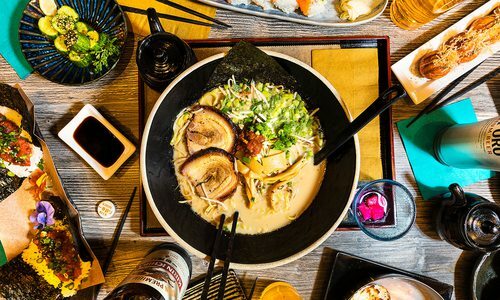 The man behind the counter quickly threw a wrench in that plan: “Order by the plate and the side is included in the meal,” he said. So we took his advice and split up the order. Brandon got the chicken plate with pit beans, I got the brisket plate with chips and an extra serving of turkey, Katelyn got the pulled pork plate with potato salad and Kevin got the sausage plate with cornbread and an extra two ribs. When our plates arrived, I was impressed with the large serving sizes, which made it easier to trade bites of everything. The best dish of the whole meal was the pit beans. These are killer, and unlike any other pit beans in town. A mix of pinto and black beans is simmered with sausage bits, and brought to life with bourbon and pie filling for sweetness. These are not just beans covered in barbecue sauce. I dipped my meat in them, I dipped my chips in them, I ate them by the forkful and could. not. stop. 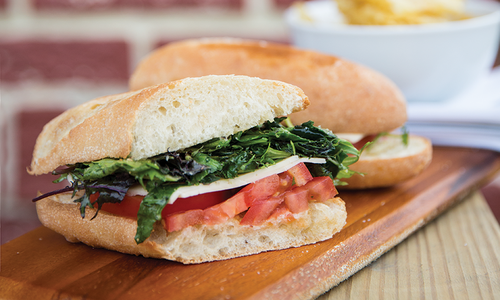 The chips also impress—they’re hand-cut and thick without losing crispiness. The cornbread comes in a thick waffle form, and it’s dense and crumbly with a hint of sweetness. The creamy potato salad tasted like mayo and onions and was fine, but it was outshined by the other sides. Also on every plate comes a pile of house-made “sugar fire” pickles. They’re crunchy and bright with a sweet taste first and a heat that kicks you on the back of the tongue. We treated them like the Southern version of sushi ginger and used them as palate cleansers. Despite all the food, we powered through the meal and clocked a new PR for meat consumed in one sitting. I walked out to the mild night a little sweaty, but a lot happy. Starving? Order an extra two ribs to pair with the sausage plate that comes with a side of cornbread. Other sides to choose from include potato salad, pit beans and chips. Night manager Adam Kissinger shows off the pulled pork plate with potato salad. 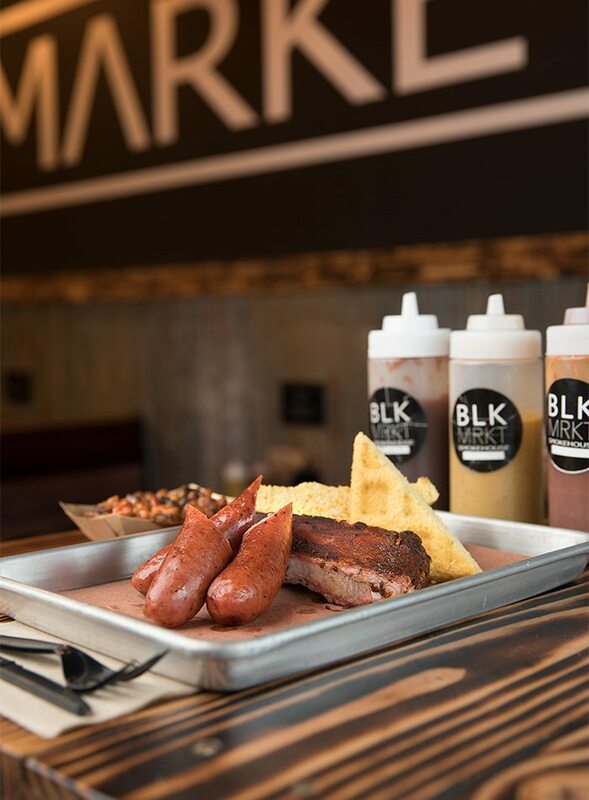 417 Magazine: When did you first come up with the idea for Black Market Smokehouse? Scott Pitts: Me and Wes [Johnson] had spoken about doing a barbecue restaurant for a while. 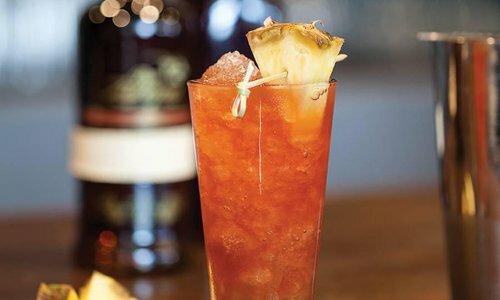 (Editor’s Note: Pitts co-owns the restaurant with Jason Delcour.) 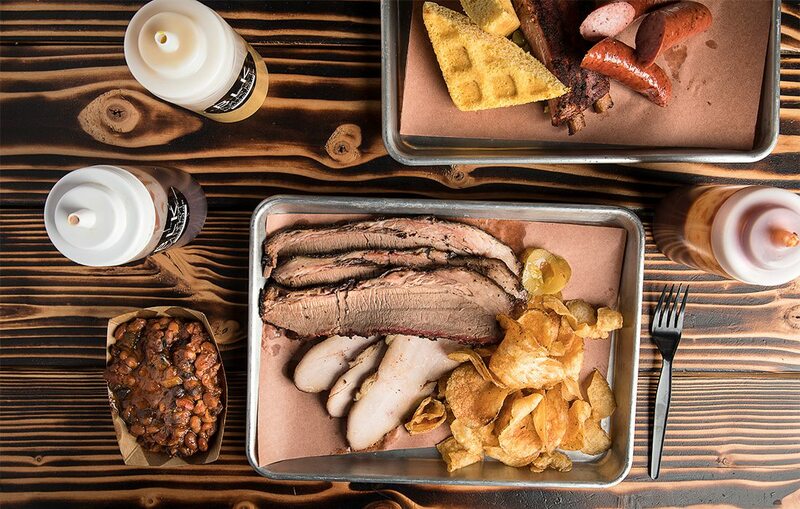 We got tired of going to barbecue places and them all being the same. Most people, when they go to a barbecue place, that’s what they want—they want ribs, beans, potato salad, you know, and it never really has to change. We don’t understand why. It’s comforting but it’s also kind of a disappointment when you’re a foodie. 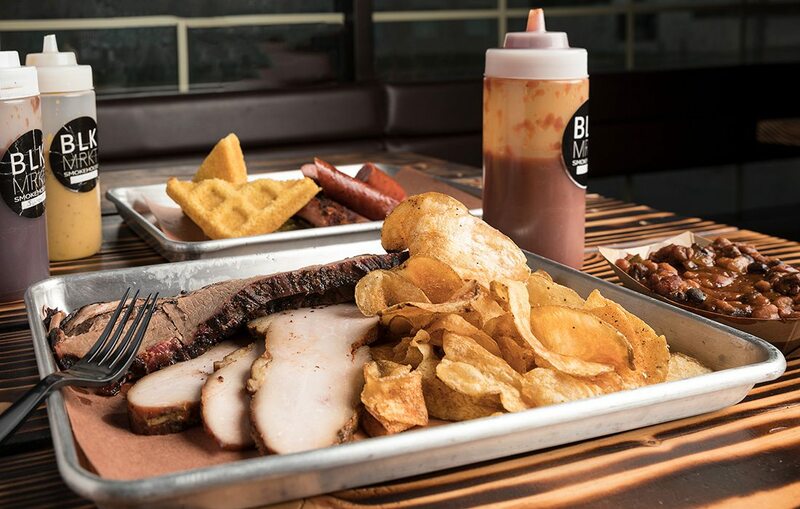 We talked a lot about if we ever do a barbecue place we should definitely rotate the sides seasonally and make it more farm-to-counter, like you kind of want to recapture that meal at grandma’s house. They use the food from the garden to make the meal. We wanted to have a reflection of that, I think more than anything. 417: How would you describe the restaurant’s identity? S.P. : We’re a smokehouse. Period. If it’s meat, we’ll smoke it. 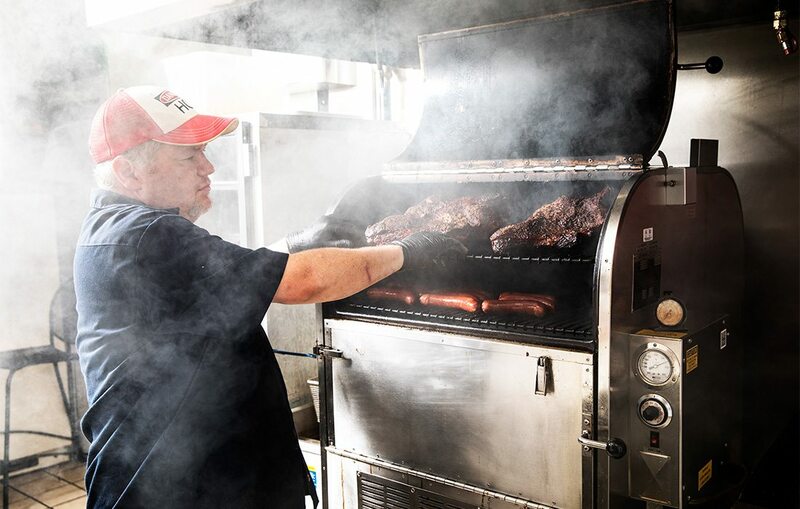 We experiment with smoking all different types of meat. Once rabbit comes in I want to start doing rabbit. But you have to get the general public’s trust a little bit before you start doing stuff like that. I think more than anything we want to do the staples and show everybody that we can do that and do it consistently, but we want everyone to come here and be excited about what we’re doing next. Want to keep people coming back not just for the staples but also to see what creative thing we do have. 417: Did the history of turnover with this particular location concern you at all? S.P. : I don’t want to lie and say it didn’t at first. Some of the businesses that were in here are not unsuccessful businesses, so it made us wonder why. Was it the price point? Was it what you were offering? Because there was Purple Burrito here before us, but Qdoba is right there and Taco Bell is right there. You’re offering the same things; there’s no variety. So we felt that the variety we were offering plus being downtown and not really having a lot of barbecue competition was a better suit for us. 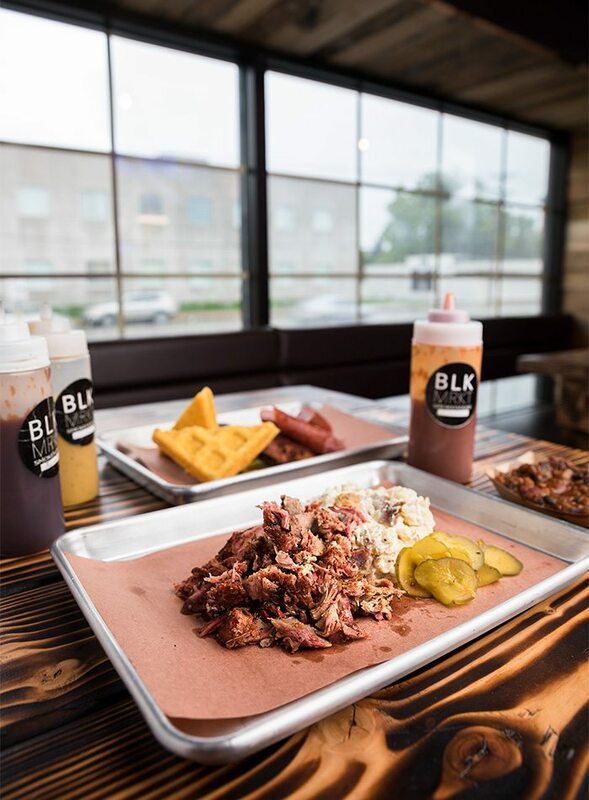 417: How do you see yourself fitting in with the other barbecue restaurants in town? S.P. : We don’t look at the other barbecue places in town as competitors. Like for lunch, because we’re so far away from them that they have their own areas that they’re competing for. Whole Hog is by Bass Pro so he’s getting all the travelers and the people that work in that area, and City Butcher is all the way on the other side of town so they get the car dealerships, and we’re downtown. We’re getting college kids, faculty and we feel like it’s not like that. There’s more than enough people to go around and there’s plenty of areas in Springfield where there’s enough barbecue. Competition is good. It makes you change the way you think about things. It makes you get back up and sharpen your game up a little bit, work a little harder. There’s nothing wrong with that. 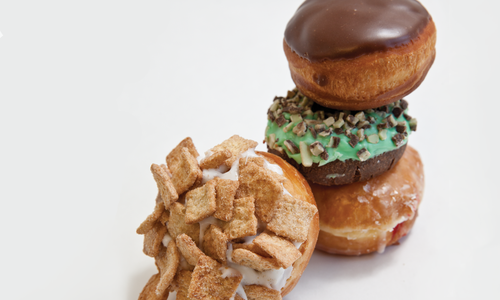 Unusual toppings and a little creativity bring nearly 100 rotating flavors to Springfield’s Hurts Donut Company.